What about the widely told and published story that George Plott came to America on September 12, 1750 on the Ship Priscilla? Very bluntly, it is wrong. The confusion comes from two books listing the surname for a man named “Johannes”. NO, George Plott did not come to America on the Ship Priscilla on the date September 12, 1750. Book One: "A Collection of Upwards of Thirty Thousand Names of German, Swiss, Dutch, French and Other Immigrants in Pennsylvania from 1727 to 1776”, written by Professor Israel Daniel Rupp, Published in 1876. The surname is “Plott”. Book Two: ”Pennsylvania German Pioneers”, Written by Ralph Beaver Strassburger and Edited by William John Hinke, Published in 1934. The surname is “Schlott”. Mr. Rupp’s book, which is Book One, has “Plott”. This is the book, which the Plott line has been using for our great grandfather George Plott. How did we get to be using this book, which lists “Johannes Plott” arriving on September 12, 1750 on the Ship Priscilla? My theory is that an early Plott genealogist, from the generation of the early 1900’s, when Mr. Rupp’s book was newly published, found “Johannes Plott” listed in the book and told family members of their discovery. I’m thinking that the person was Grace Plott, as she lived in the vicinity of the Atlanta Library, while working as a nurse at Piedmont Hospital. In 1931, Grace was a victim of a hit and run car driver. She died from the injuries at the age of 40 years old. Book Two by Strassburger and Hinke was published in 1934; three years after Grace’s death. I am sure that with Grace’s tenacity for research, she would have found Strassburger and Hinke’s book, ”Pennsylvania German Pioneers”, which corrected the name to be “Johannes Schlott”. As the Plott line, in general, respects Grace Plott and James Iverson Plott’s efforts, we just have not eagerly questioned or wanted to change the information of Johannes “George” Plott arriving on September 12, 1750 on the Ship Priscilla. Although over the years, subsequent serious and true Plott line researchers have wondered about the two books discrepancies. ​Very simply explained, Book Two is correcting the transcription error of Book One. Book Two corrects Book One. The name is Johannes Schlott, who lived in Pennsylvania. In the "Forward" of ”Pennsylvania German Pioneers”, Mr. Ralph Beaver Strassburger, LL.D. wrote, "Rupp strove to arrange the names of the ships in chronological form, but the names of the passengers were not printed in the order in which they appeared on the official lists. The names were generally written in the German script, and many required translation. It should be stated, in justice to Rupp, that he worked in the face of great difficulties in publishing his book, together with other editions, including the names of children and of adults, covering a period of twenty years. " 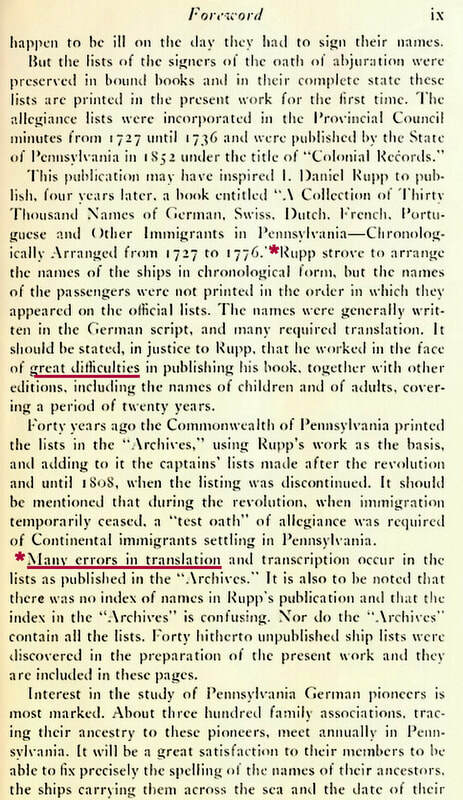 And, ​"Many errors in translation and transcription occur in the lists as published in the "Archives." It is also to be noted that there was no index of names in Rupp's publication and that the index in the "Archives" is confusing. Nor do the "Archives" contain all the lists. Forty hitherto unpublished ship lists were discovered in the preparation of the present work and they are included in these pages." Then, in the "Introduction", Mr. William J. Hinke, Ph.D., D.D. Auburn Theological Seminary, Auburn, New York wrote, "The most serious criticism of Rupp's book, is however, that in literally hundreds of cases he failed to decipher the names correctly. It is, of course, true that in some cases no man living can decipher with certainty the awful scribbles of some of the writers. But, when there are several lists of a ship, we can secure much better results by a comparative study of the lists, which Rupp entirely neglected." "Forward" of ”Pennsylvania German Pioneers”, Mr. Ralph Beaver Strassburger, LL.D. Well, why can’t we just look at the ship’s log and read the name? Let me step back a minute and explain that technically, there is not an actual ‘log of passengers’ for the Ship Priscilla in the books listed above. If the Ship’s Captain turned in a list of passengers, the list would have been on a “loose piece(s) of paper”. Unfortunately, over time, many of these ship logs written on loose pieces of paper have been destroyed, lost or disintegrated. Here are the cold fact numbers, from 1727 to about 1775 approximately 324 ships came into Philadelphia; however, only 138 passenger logs exist today. Although the British government attempted to collect passenger logs from Ship Captains, the effort by the Captains to comply with providing ship logs and the effort by the British councils to enforce ship logs was poor. In fact the Ship Captains were ordered to (1) make a list of passengers, (2) provide the passengers’ occupations, and (3) provide the passengers’ origin locations. Let’s go back to 1750 for a moment and remember that the American Colonies were under British rule and its officials felt intimidated by the high numbers of various ethnic immigrants (especially, German and Swiss) coming into America; ergo, it had required varying oaths over the years. Two of the oaths were an Oath of Allegiance to Great Britain and an Oath of Abjuration (renunciation) of the Catholic Church to thwart any political and/or religious unrest. In order to secure these pledges, the British deemed that all incoming male immigrants over the age of 16 years old, would be escorted from their ship to the port city courthouse to pledge and sign their Oaths to Great Britain. On September 12, 1750, a group of men, who were not ill on the day, over the age of 16 years old from the Ship Priscilla were escorted to the Philadelphia Courthouse. One of these men signed and recorded Johannes Schlott, as corrected by Book Two - ”Pennsylvania German Pioneers”, Written by Ralph Beaver Strassburger and Edited by William John Hinke, Published in 1934. The surname is “Schlott”. Note: I think that this requirement of ‘male immigrants over the age of 16 years old’, and to mathematically calculate George marrying/starting a family, is how the story of him being 16 years old when he came to America began. Now, we know by George’s son, Daniel, in 1837 that George was a child when he came to America, “Vater und Mutter waren als Kinder aus Deutschland gekommen.” We now know that the Plott family came to American on the ship Marlborough on September 23, 1741, when George was about six years old not sixteen years old. The name is Johannes Schlott NOT Plott. Mr. Schlott lived in Pennsylvania. Our great grandfather George Plott moved to North Carolina. Two totally different individual men. Well, can we analyze Johannes Schlott’s signature and make sure that it is not our great grandfather George Plott’s signature? Yes. Using an old German example table of script letters and remembering that we are reading a signature from 1750 by a man with his own unique German penmanship, we can decipher the surname. It is “Schlott”. Johannes Schlott’s signature is neat, is well-practiced, and is written in a level line. In writing Schlott, within the “Sch”, the letter “c” can be dragged away and implied. This is what Mr. Schlott did. He did not write the letter “c”. He wrote Johannes Shlott. 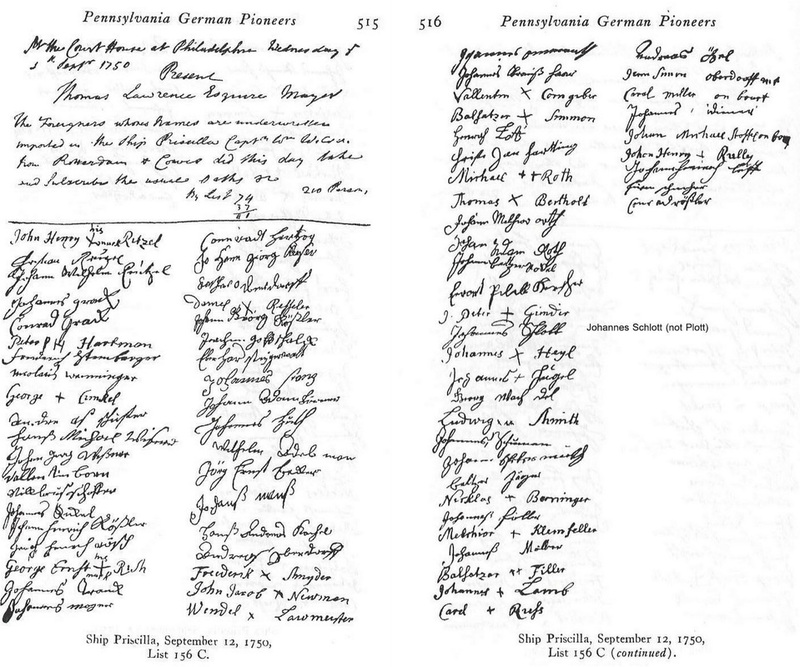 Reviewing the facsimile signature in the “Pennsylvania German Pioneers” 1934 book, page 516 List 156 C (C List Oath of Abjuration), and “Capital German Letter Used in the Lists” of the same book, page 892, the first letter of the surname does not have the characteristics of a letter “P”. The lower hoop should not be there and the upper hoop does not have the left-line-edge script of the letter “P”. It is not the letter “P”. However, reviewing the upper and lower hoops of the “Sh” with the “c” being implied; plus, remembering that the writing is old German script; plus, taking into consideration the writer’s unique penmanship; plus, adding the “lott”, the name is “Schlott” (c implied). The name reads “Johannes Schlott”. What is the evidence that a man, Johannes Schlott, lived and existed? In 1884, Joseph Uhrich, a great grandson of Johannes Schlott, wrote memoirs identifying Johannes Schlott on the September 12, 1750, Oath of Abjuration, Ship Priscilla, as the forefather of his Schlott line of Reamstown, Lancaster County, Pennsylvania. There are church records, land records, military records, children's records, and a will record for Johannes Schlott in Lancaster County, Pennsylvania. Johannes Schlott had a full life and family in Lancaster County, Pennsylvania. 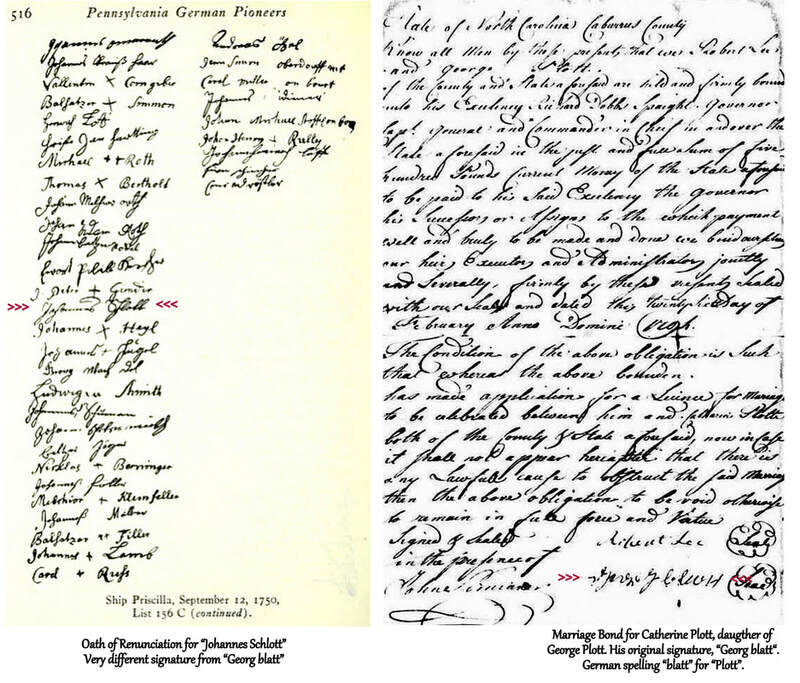 Plus, the author of this report, acknowledges that the signature for Johannes Schlott on the Oath of Abjuration varies greatly from a true original signature of George Plott on the marriage bond for his daughter Catherine. With all of these realities, the author of this report is convinced that said Johannes Schlott is not George Plott. They were two separate men. It is correct for us to stop using the September 12, 1750 date, stop using the Ship Priscilla and stop using Johannes Schlott for George Plott. It is wrong for us to use another family’s great grandfather as ours. No, George Plott did not come to America on the Ship Priscilla. The quest to find the ship George Plott came to America on and when he came to America continues. Comparing the scripts of Johannes Schlott versus Georg blatt (German script for George Plott). Two different signatures; each from two individual men. Have the expert archivists at the Pennsylvania Historical and Museum Commission been asked to review the signature? Yes. On January 8, 1974, Barbara Philpott, Assistant Archivist in the Division of Archives & Manuscripts replied, “...upon consulting a photocopy of the original list containing signatures, we wish to say that we believe the name is Johannes Schlott, not Plott. Then too, Johannes would not be translated in the English George but would stay as Johannes or some contraction thereof. Below are the Last Will and Testaments for George Plott, who died in North Carolina and Johannes Schlott aka John Shlott, who died in Pennsylvania. George Plott died in 1815 and Johannes Schlott died in 1789. 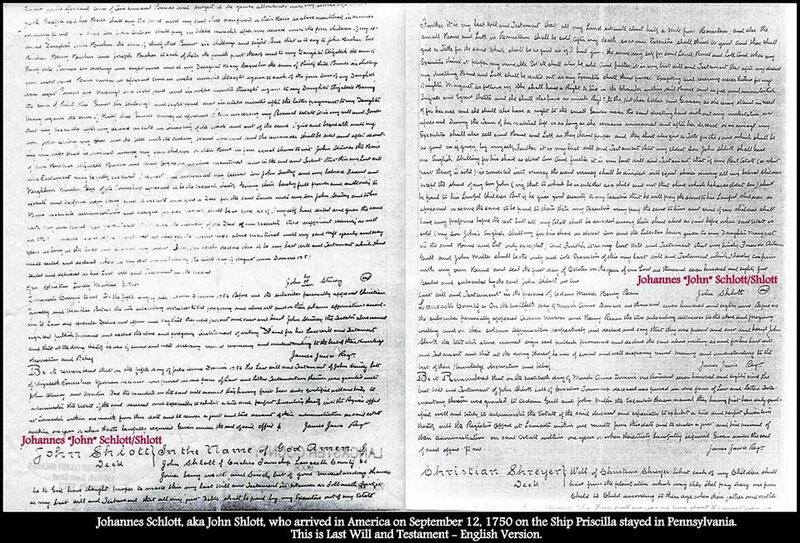 Johannes Schlott came to America on September 12, 1750 on the Ship Priscilla. George Plott came to America on September 23, 1741 on the Ship Marlborough with his father, Görg Plott. George Plott and Johannes Schlott were two entirely different men with two entirely separate lives. Please note on Johannes Schlott's Last Will and Testament that he shortened his name to "John Shlott". This is a prime example of the Latin to English translation of Johannes to "John" not Jonathon. The German rule of "drag away the "c" was used from Schlott to Shlott. Last Will & Testament of Johannes Schlott aka John Shlott of Pennsylvania - Died in 1789. Please note that Johannes Schlott has shortened his name to "John" Shlott. The Latin to English translation of Johannes is "John" not Jonathon. The German rule of "drag away the "c" was used from Schlott to Shlott.